On Friday, April 15, 2005, just before the start of Spring Break, Russell was the first to arrive. Although the house-raising party was not due to begin until Saturday morning (9:00 am, to be exact), Russell had taken Friday off from work for last minute preparations. We decided that it would be cheaper for Russell to drive his own car up early in the day and pitch tents, as opposed to having everyone drive up later in the evening and stay at a motel. So, Russell had a nice daylight drive and arrived on top of the mountain by lunchtime. His sister Joanne showed up about two hours later, with her children Blake and Alison. They had just spent the week at Lake Tahoe, so they came in from the opposite direction. Everyone pitched tents, then went into town (Valley Springs) for the terrific all-you-can-eat Chinese dinner buffet at "Good Friends." The rest of the family arrived later that evening. Gail (with Cameron and Joss) actually met up with Joanne's husband Matt halfway along the drive, and they arrived together at just about sunset. We called it an early evening, in anticipation of a very busy next day. On Saturday morning at 9:00 am, the party really began. Crane guy Frank Gilbeau arrived right on time, followed immediately by Russell's friends Charlie and Gayle; then Gail's sister Debbie, husband Steve, and son Eric -- all of whom had driven up from the Bay Area bright and early that morning. Arriving locally was our more-than-a-realtor, Scott Bur. Our overall goal over the next nine days was to assemble as much of the two-story skeleton as possible. Topsider had told us that a crew of six strong men could put it up in three to four days. We were counting on six middle-aged men, four women, four kids, and nine days. 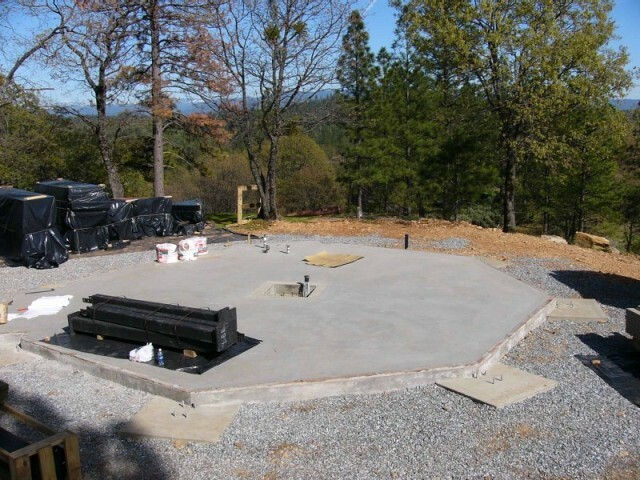 During preparations over the last several weeks, Gail and Russell had continually lowered their expectations from "the whole two story skeleton" to "maybe the first story" to "hopefully we'll get the posts plumb" to "hope it doesn't rain for an entire week." On this gorgeous, sunny but not-too-hot Saturday morning, our first step was to set the eight iron corner posts upright and bolt them in. Coincidentally, this is also where we encountered our first showstopper. 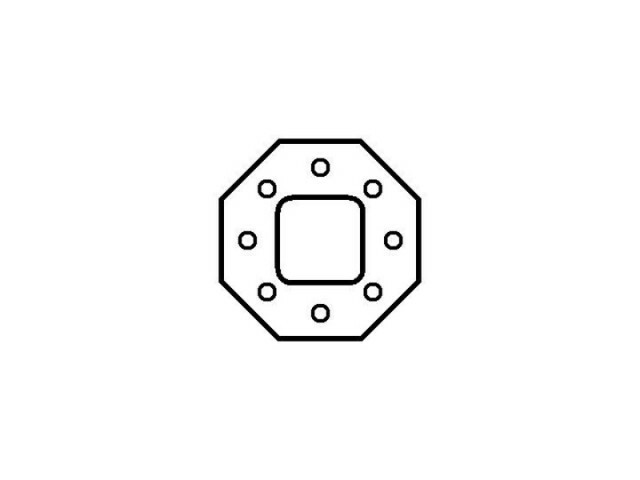 We had always been concerned with whether the bolt pattern in the foundation would match the hole pattern in the corner posts. Our foundation guy, Rick Dietrich, had actually been out to the building site several times during the past month, moving things around, adjusting bolts with a sledge hammer, and even making notches in the corner posts with an acetylene torch. Even so, at best we were expecting a very, very, tight fit. We didn't even get that. Out of eight corner posts, we got one that matched the bolts. The rest wouldn't even sit on the bolts, let alone sit on the ground. Plan A was to enlarge the bolt holes using a Sawzall that Gail had borrowed from her brother Tim (per Topsider's recommendation). Plan A succeeded in completely destroying the Sawzall blade. Plan B was for Russell and Scott to drive to Scott's house and come back with an acetylene torch. This took a good hour back and forth. In the meantime, Gail got on the cell phone with Rick Dietrich. Not only did Rick come over immediately, he also brought his father Dan, a retired commercial construction worker. Rick and Dan worked superbly as a two-man team, torching every single iron corner post until they fit into their spots. Next came the most anticipated step in the entire process: setting the 26-foot, 2,600 lb. 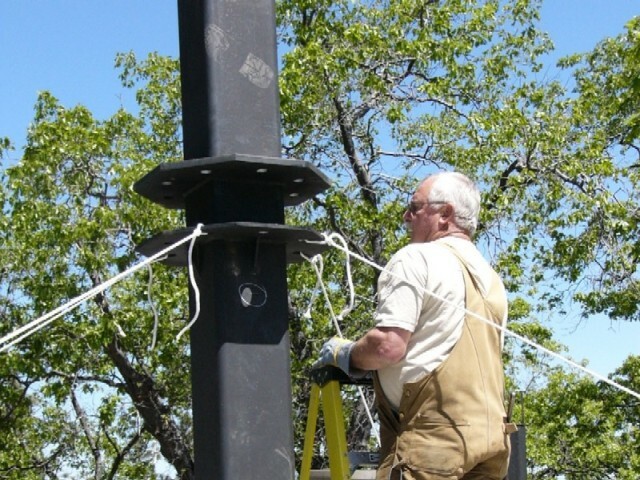 center column in place. While the corner posts could theoretically have been set manually (which we didn't do), the center column could only be set by a crane. 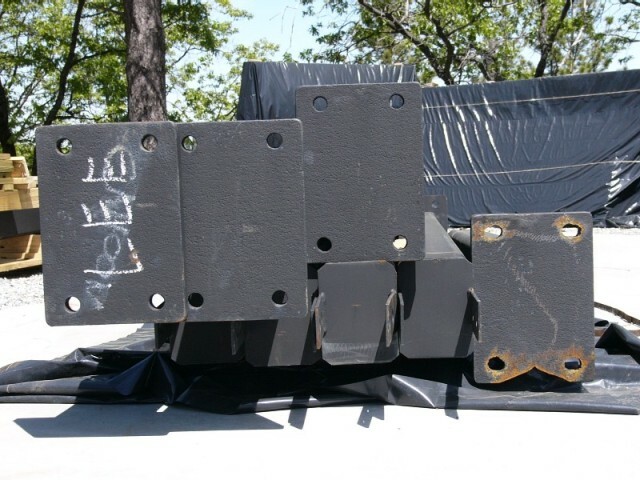 This column is the foundation of Topsider's "post and beam" engineering design. The center column bears almost all of the weight of the entire house, so that none of the walls are load bearing. Surprisingly, this also turned out to be the easiest job in the process. 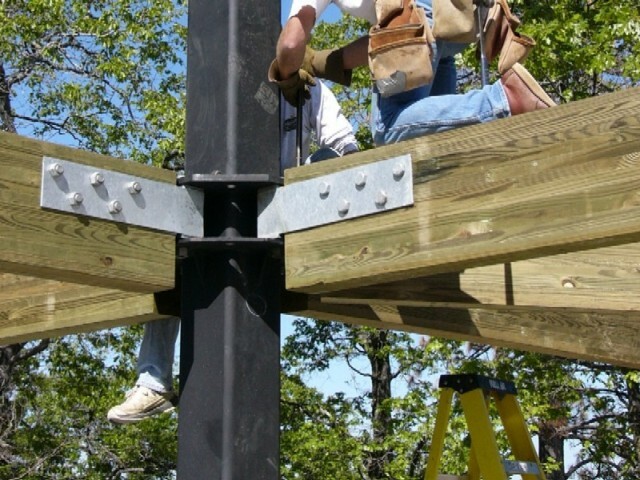 Unlike the corner posts, the center column rests on top of nuts, which makes leveling very easy. In no time at all, it was both plumb and level. Next came the eight gigantic glu-lam beams. 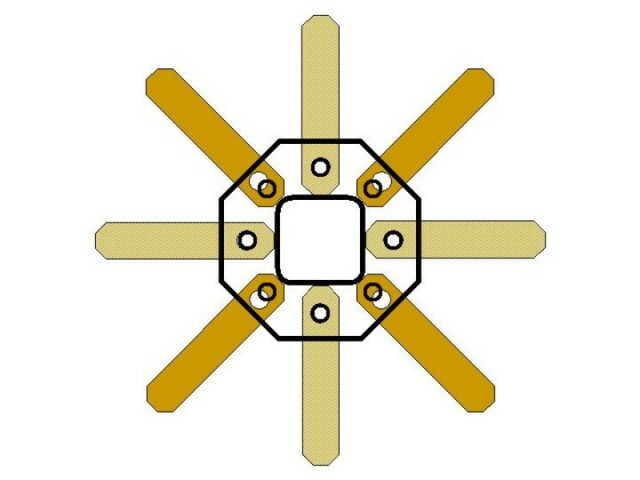 If you think of the octagonal house as a large wheel with the center column as the axle, then the glu-lam beams are the spokes. 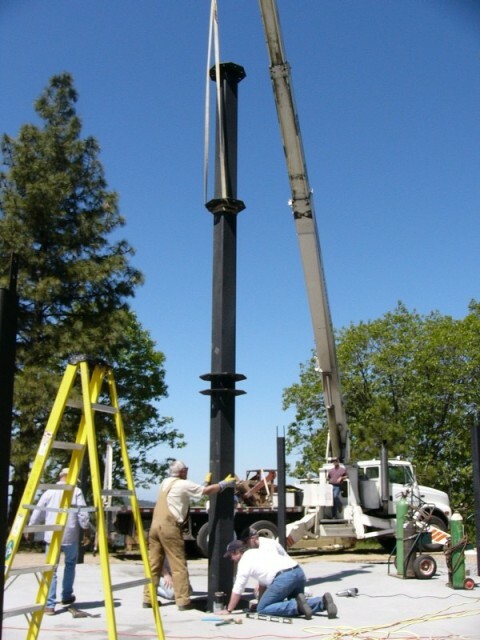 They connect the center column to each of the corner posts about ten feet above the ground, creating the foundation for the second floor. Here we ran into the biggest problem of the day - actually, the biggest TWO problems. Problem One: How many years has Topsider been doing this? 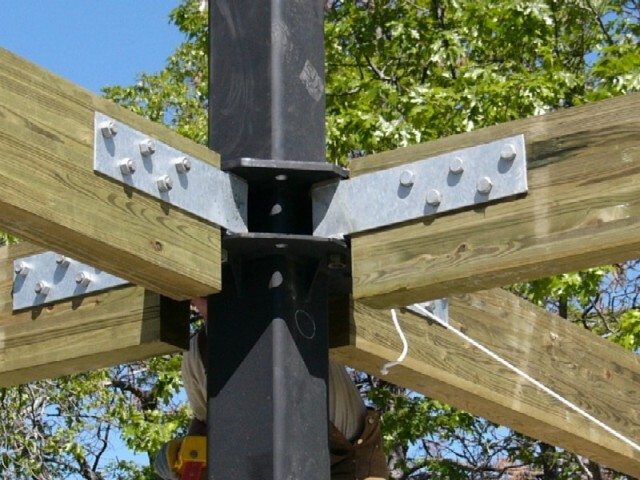 Basically, each glu-lam beam fits into a slot in the center column, and is then secured with a huge bolt and nut. With the help of Frank and his crane (and Rick and Dan, who stayed to help when it became obvious that none of the rest of us knew what we were doing), the first four beams went in fairly well. One of them was very tight in the slot, but a comealong fixed that. It was when we tried to fasten the bolts that we discovered an amazing error. The thickness of the beams was about eight inches. The length of the bolts was about eight inches. 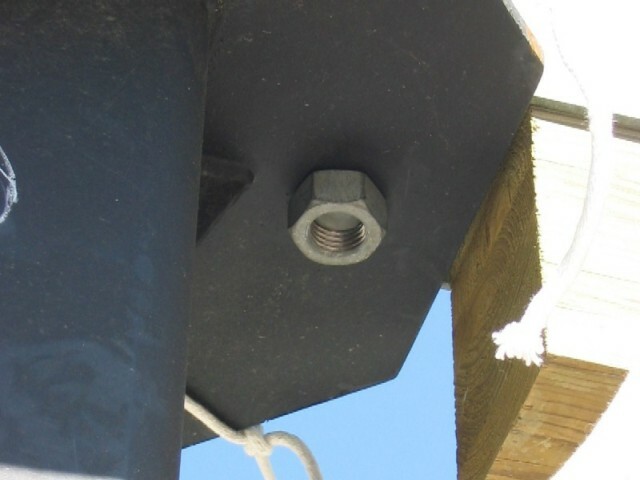 In other words, when the bolt was inserted into the beam, it only left about two threads for the nut. This is not a very secure way to secure an entire second story. 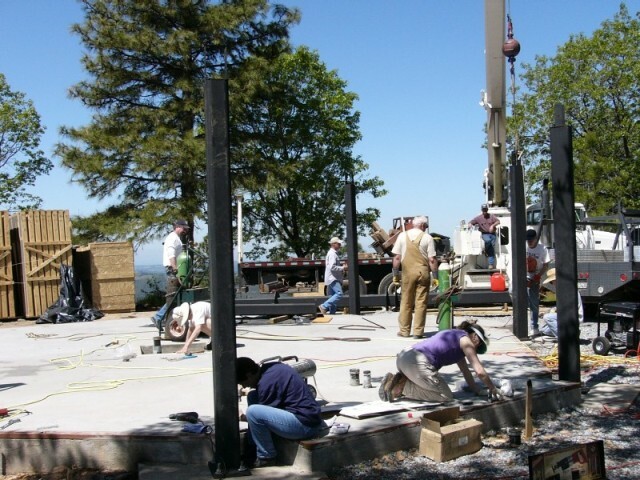 There was no way to contact Topsider on a Saturday, and we could not afford to halt construction at this early stage. We made the decision to keep the short bolts in as "place holders," continue with construction, and replace them later. Problem Two: HOW MANY YEARS HAS TOPSIDER BEEN DOING THIS??? The second problem came when Rick and Dan (who by now had assumed a leadership role) came to set the second four glu-lam beams, the ones that would spread out diagonally. They wouldn't fit. We tried shoving, pounding, hammering, inserting, and reinserting. They wouldn't fit. After many fruitless tries, we took a closer look and discovered an amazing error: Topsider had apparently not accounted for the corners of the center column. 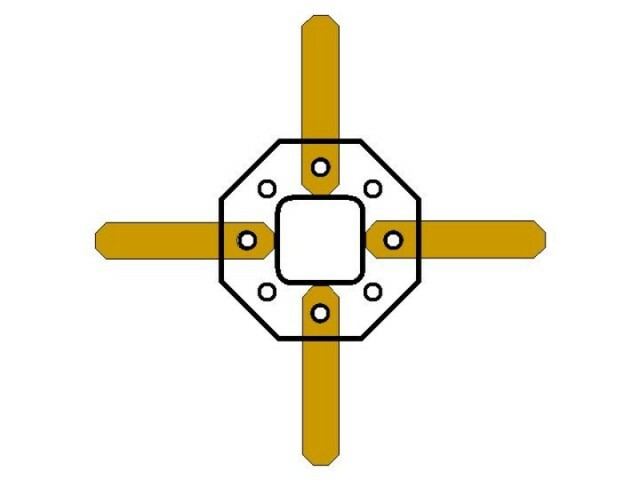 The first four beams, which hit the center column on each of its four flat faces, had no problem. 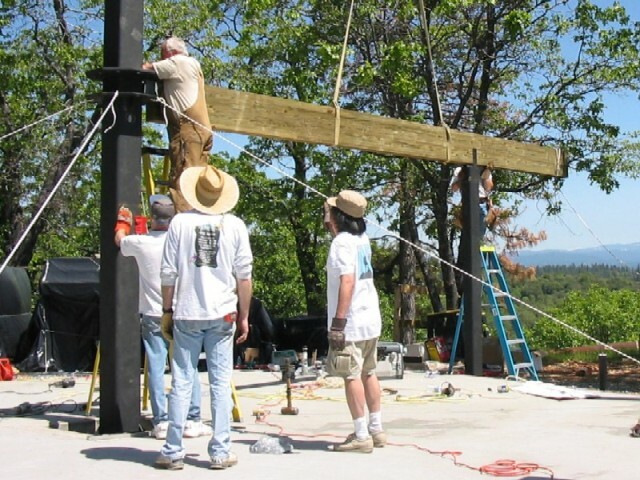 The second four beams, which hit the center column on each of its corners, had a problem. 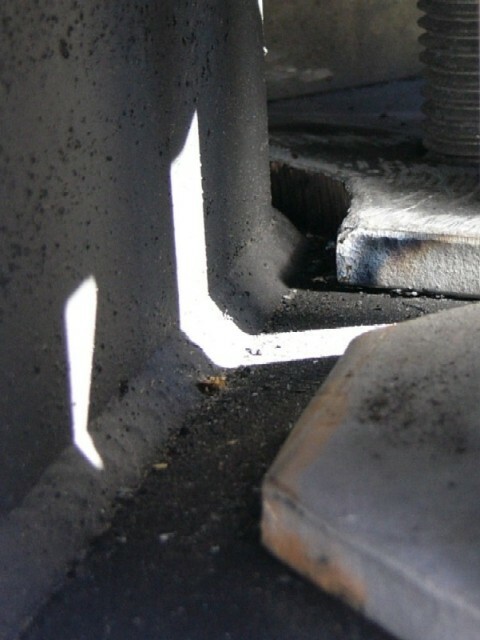 The beam hit the corner before the bolt holes could line up. It was when we tried to set the fifth glu-lam beam that we discovered the problem: the beam hit the corner of the center column before the bolt holes could line up! It was at this point that Rick and Dan really earned their stripes (and our undying accolades). 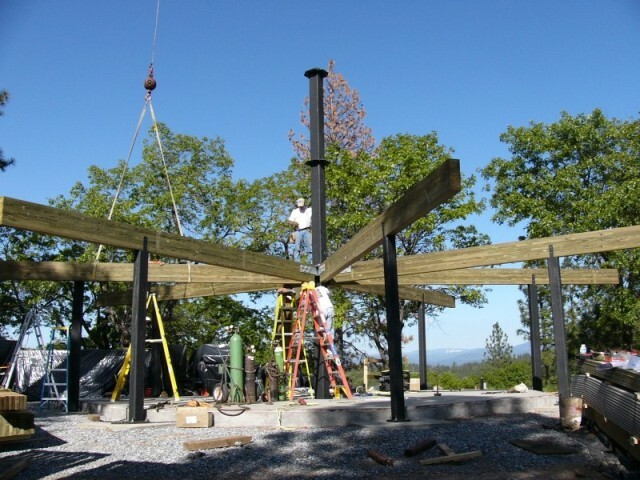 They had to use the acetylene torch to burn a crescent out of each of the beam brackets. Our best guess was that this would NOT weaken the structure in any way. Besides, it was the only way to get the beams to fit. 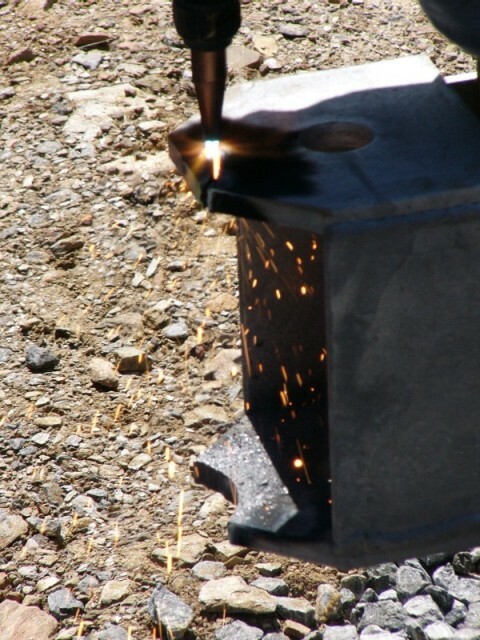 Dan had to use an acetylene torch to cut a crescent out of each glu-lam beam bracket. This was the only way to get them to fit against the corners of the center column. There was still no way to contact Topsider on a Saturday, but Gail was assembling quite a list for a Monday telephone call. Nevertheless, we now had a first-floor skeleton in place, just in time for dinner. After having spent the entire day on our project (and forsaking who-knows-what-other important jobs they had), Rick and Dan said their goodbyes. Either they felt that the construction was now in good hands, or they figured the skeleton was now too solid for any of us to break anything. 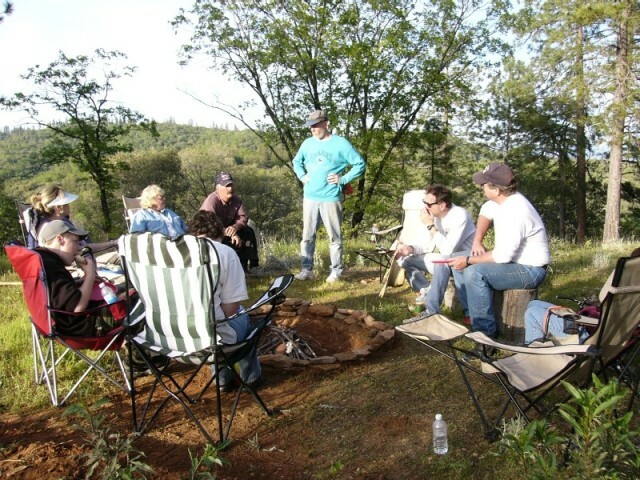 Frank's wife Lee Ann joined us for an outdoor dinner of burritos, and even surprised us with a home-made lemon cake. On that happy note, we called an end to our first day of home construction.